The Hudson Horror Show is on today at the South Hills Cinema 8 in Poughkeepsie, NY. Tonight, the Alamo Drafthouse in Yonkers, NY presents Kevin and Matt Geek Out About Zombies featuring comedy Kevin Maher and filmmaker Matt Glasson (Love Stalker) and special guests Brian Solomon (The Vault of horror) and Captain Cruella (Village Invasion Zombie Crawl). The show is billed as "an obsessive look at zombies, from WHITE ZOMBIE to WORLD WAR Z. The hosts explore pre-Romero voodoo zombies, Night of the Living Dead rip-offs, the recurring theme of Nazi Zombies in film, and the recent run of zombies overtaking pop culture." The Alamo Drafthouse is located at 2548 Central Park Avenue in Yonkers, NY. Tickets are available on their website and at their box office. For their big season finale tomorrow, The Walking Dead are taking over Instagram! Use #AskTWDCastChat to ask The Walking Dead's Josh McDermitt your questions during his Twitter Q&A tonight at 8:15pm ET. Use #AskTWDMelissa to ask The Walking Dead's Melissa McBride your questions during her Twitter Q&A tonight at 8:30pm ET. Have a comment or question for Ross Marquand, the actor who plays 'Aaron' on The Walking Dead? Tweet it tonight with the hashtag #AskTWDRoss, and he might respond during his Q&A, starting at 8:30pm ET. Have a question or comment for the cast and crew of The Walking Dead? Tonight is your chance to ask them on Twitter. Tweet with #AskTWD and you might get an answer between 8pm and 9pm ET. The cast of The Walking Dead is hosting a Google+ Hangout on Tuesday, February 3rd at 12pm ET and you're invited! Norman Reedus (@wwwbigbaldhead) will be live tweeting tonight for The Walking Dead's mid-season finale. Log on and join in to get your questions and comments heard. The Hudson Horror Show IX is happening tomorrow, Saturday, August 9th, in Poughkeepsie, NY. And next month, in conjunction with the Alamo Drafthouse in Yonkers, NY, the Hudson Horror Show is hosting a screening of Tombs of the Blind Dead and Tourist Trap on September 20, 2014. Marq Romero ran The Walking Dead Escape at the San Diego Comic-Con this year as a "survivor" and record the whole thing via Google Glass. You can read his full report on Bleeding Cool: "The Walking Dead Escape Though Google Glass At San Diego Comic Con." Fangoria is screening The Return of the Living Dead in 35mm at the Alamo Drafthouse in Yonkers, NY this Friday, May 23rd, at 10pm. The Return of the Living Dead, released in 1985, was directed by Dan O'Bannon, and starred Clu Gulager, James Karen, Thom Mathews, and Linnea Quigley. The film will be introduced by Fangoria's Managing Editor Michael Gingold. This is a rare chance to see this zombie classic on the big screen so don't hesitate to get your tickets now right here: Return of the Living Dead. Join the Brooklyn Game Lab tonight for a free demo of Zombicide! Brooklyn Game Lab is located at: 353 7th Avenue, Brooklyn, NY 11215. As if there was any doubt, THE WALKING DEAD will once again make a stand at New York Comic Con. On Saturday, October 12th at 6:30pm, the producers and cast of THE WALKING DEAD will take to NYCC's Main Stage 1-D for an hour long panel discussion. "Join Andrew Lincoln, Chad Coleman, Lauren Cohan, Steven Yeun, Danai Gurira, Melissa McBride, Norman Reedus and producers of “The Walking Dead” for a panel moderated by Chris Hardwick (The Nerdist, Talking Dead). The panelists will be on hand to discuss the upcoming fourth season of the series as well as introduce an official, never before seen, sneak preview. Content and language in this panel may not be suitable for children." Today is the day - the first Saturday in May - Free Comic Book Day! Find your local comic shops with the Free Comic Book Day Store Locator. Dark Horse Comics is hosting a Twitter chat this afternoon with the creative team behind the comic adaptation of Naught Dog's upcoming zombie video game The Last of Us. 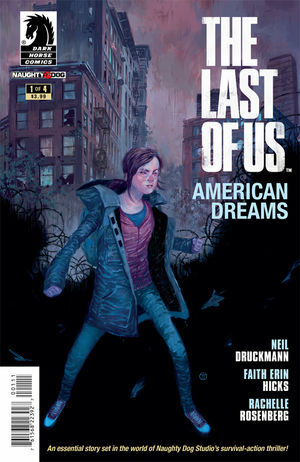 "We'll be taking over the Dark Horse Twitter feed for one hour next Wednesday April 10th to chat with Naughty Dog's Video Game Last of Us and Comics Writer Neil Druckmann and Comics artist and writer Faith Erin Hicks. Join us to ask your questions about the new series #TheLastofUsAD, the writing process, and what we can expect from the brilliant new series based on the Video Game going forward! Not only will everyone get to ask questions of the two creators about the the brilliant and beautiful new series, but we are giving away 10 FREE Digital copies of Last of Us #1 to participants." Follow @DarkHorseComics and use hashtag #TheLastofUsAD for the chat that begins today, Wednesday April 10th, at 2:30pm ET. The Walking Dead's PaleyFest panel is in theaters tomorrow, March 7th, for a special one day presentation of the discussion and Q&A that took place on March 1st with the creators and cast of the show. "On March 7th, join Fathom Events and The Paley Center for Media, as they bring the stars of TV's edge-of-your-seat drama "The Walking Dead" to movie theaters nationwide to kick off PaleyFest - the ultimate TV fan festival. Captured live from the Saban Theatre in Beverly Hills, CA on Friday, March 1, this one-night event provides the unique opportunity to join the incredible cast as they screen exclusive never-before-seen footage and take part in a no-holds-barred Q&A." Check with Fathom Events, Showcase Cinemas or your local theater to see if you have a screening near you. Tonight in Pittsburgh, the Senator John Heinz History Center is hosting a 45th anniversary screening of George Romero's Night of the Living Dead along with a contest to find the city's best zombie. This event is being held in support of their new exhibition of 1968: The Year That Rocked America. The fun starts in just under an hour so, if you're thinking of going, you better run like the living dead are chasing you! "Watch "Night of the Living Dead" at the History Center… if you dare. The 1968 cult classic, which revolutionized the horror genre, was filmed in and around Pittsburgh by the "Godfather of Zombies” George A. Romero, and celebrates its 45th anniversary this year. Frightfully fun snacks and refreshments, including alcoholic beverages, popcorn, and retro candy, will be available for purchase. The winners of the inaugural Pittsburgh's Best Zombie Contestwill be crowned the Zombie King and Queen of Pittsburgh, and will each receive a prize package including a ScareHouse prize coffin with two RIP passes to The ScareHouse 2013, and merchandise from House of the Dead, Pittsburgh's premier zombie store. To enter, just show up dead and ready to scare!" Find out the full info on their event page. Warm Bodies heats up their pre-release marketing with a live chat today at 11:25am PT with Nicholas Hoult, Teresa Palmer and Rob Corddry via a ClevverTV.com Google+ Hangout. Warm Bodies, based on the book by Isaac Marion, will be released in theaters on February 1, 2013. Milla Jovovich Resident Evil Video Chat Tonight! Video chat with Resident Evil: Retribution's Milla Jovovich tonight! Here's the link for the Oncam chat.